ome eight short months later England found itself at war with France yet again. In June, 1803 Brigadier-General John Skerrett, still in command of His Majesty’s troops in the Colony, was ordered to raise a fencible regiment in Newfoundland. This call to arms was consistent with similar arrangements throughout the British Empire in response to aggression by Napoleonic France. Skerrett was ordered to raise ten companies many of whom were recruited from the Royal Newfoundland Regiment that had been only recently disbanded. The new Regiment was to be the Newfoundland Regiment of Fencible Infantry. Officers who joined the Regiment and who had previous service with the recently disbanded Royal Newfoundland Regiment included Captains Van Cortlandt, Tremlett, Lelieve, Hierlihy and Lieutenants LeBreton, Weeks, Skinner, Gethings and Walsh. By 1806 the Regiment numbered nearly seven hundred men and were renamed the Royal Newfoundland Regiment when the title “Royal” was conferred by King George III. The next year they were loaded aboard transport ships and sent to Halifax, Nova Scotia where they remained in garrison for one year before being sent to Quebec in 1807. That same year the British Government began the practice of stopping all ships on the high seas fearing that some might be providing supplies to France. The Americans were outraged and by 1812 war was declared between the United States of America and the British Empire. Because of their extensive experience as both soldiers and sailors over half of the Regiment consisting of five companies were posted to Kingston, Upper Canada for service aboard ship, the remainder were assigned to detachments at Quebec, Prescott, Fort George and Fort York on the Niagara Peninsula. In July, 1812, General Isaac Brock, Commander-in Chief of British Forces in Upper Canada, ordered an assault on the American fort on Mackinac Island. This engagement marked the opening of hostilities between American and British forces. A small detachment aboard the armed brig Caledonia which was manned by members of the Royal Newfoundland Regiment successfully convinced the American defenders to surrender the fort effectively closing the American gateway to the northwest of Upper Canada. A detachment of the Royal Newfoundland Regiment would defend this post throughout the duration of the war. General Hull returned to face a court-martial for his conduct of the campaign, was sentenced to be shot, and was immediately pardoned. On October 13th, the Americans launched their first great offensive of the war. The American commander, General Van Rensselaer, commanded a force of nearly 6500 troops. On October 13th, 1812 he was able to position his army atop Queenston Heights despite a spirited defense by its British defenders which included elements of the Royal Newfoundland Regiment. General Brock departed Fort George and led a force which attempted to dislodge the Americans. The first attempt failed and General Brock was killed by an American sniper. British reinforcements from Fort George were later able to outflank the Americans who eventually surrendered marking Queenstown Heights as a glorious victory for the British despite the loss of their beloved commander. The Newfoundland Regiment found itself ordered from Kingston to Fort Erie to support the garrison there. Fort Erie gave the British strategic control over the upper Great Lakes. An American attempt to take Fort Erie on 1 December failed as the garrison refused to surrender to the numerically superior American force. The onset of winter and the stubborn resistance by the garrison which included the Royal Newfoundland Regiment convinced the Americans to end the winter campaign and go home. The campaign in the Fort Erie area continued. Two companies of the Royal Newfoundland Regiment participated in the recapture of Frenchtown from the Americans under General James Winchester in January 1813. The Newfoundlanders formed the sleigh establishment that dragged the British cannons across the frozen lake. Those Americans that were able to retreat across the Raisin River survived. Those who resisted were hunted down and slaughtered by the Indians in what turned out to be a massacre. All but 50 of the nearly 100 Americans were either killed or captured. The action by a company of the Royal Newfoundland Regiment, led by Lt Rolette who was killed by a musket ball to the head, in assaulting the American guns was perhaps a defining point in the heated engagement. 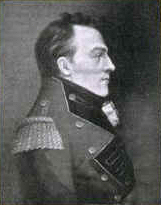 In 1813, Major Heathcote, Commanding Officer of the Royal Newfoundland Regiment, was ordered to move his headquarters in Kingston to the Provincial Capital of Upper Canada at York. The Regiment now had the Flanking Company at Fort Erie under Captain Whalen and another company under Captain Mockler at Fort Amherstburg with the remainder of the Regiment at York. The Americans were intent upon a spring offensive to reverse some of the defeats they suffered throughout 1812. They settled on York which had less defenses than Kingston and was the seat of government. On April 26th Major General Henry Dearborn lead a force of 1700 troops across Lake Ontario intent on the capture of York. York was defended by about 800 British troops which included two companies of the Royal Newfoundland Regiment under command of Major Heathcote. The Americans landed at Humber Bay several miles from York. The Royal Newfoundland Regiment were sent out to delay their march toward York. Thirty six of the Newfoundland Regiment were killed or captured by the advancing Americans. The British were entirely outnumbered and decided to blow up the powder magazines in Fort York to ensure that the Americans could not use it. The British then evacuated to Kingston. General Dearborn followed up on his victory at York with a general assault on the British position at Fort George in May 1813. The American assault was led by Colonel Winfield Scott who would later become the highest ranking officer in the American forces. Again the Royal Newfoundland Regiment found themselves engaged in close bayonet fighting as they tried to resist the American landing. The Grenadier Company of the Royal Newfoundland Regiment lost 21 killed and 12 wounded attempting to slow the American advance on Fort George. Suffering heavy losses the British Commander General John Vincent ordered the artillery pieces to be spiked and the fort abandoned to the Americans. The Royal Newfoundland Regiment were tasked with rearguard action as the British Army retired to Beaver Dams west of the Niagara River ahead of the advancing American army. While the British regrouped at Beaver Dams another British Force led by Governor Prevost himself decided upon a preemptive strike on the American shipbuilding site at Sackett’s Harbour. With three ships of the Royal Navy, crewed by the 230 members of the Royal Newfoundland Regiment stationed at Kingston, and a number of transport boats, the British force departed Kingston intent on the capture of Sackett’s Harbour. Due to the hesitancy of Governor Prevost, the assault gained little military advantage but did result in the loss of nearly three hundred British soldiers including four of the Royal Newfoundland Regiment. An immediate pursuit after the capture of Fort George might have sealed a larger victory but Dearborn, after occupying Fort George, waited several days and then sent about 2,000 American soldiers after the British. The detachment advanced to within ten miles of the British and camped for the night with slight regard for security and even less for the enemy's audacity. On the night of July 5th the British decided on a night attack. The American sentries were located by a force which included the Royal Newfoundland Regiment, and were bayoneted with quick dispatch. The British then charged the American lines sending the enemy into full flight. The British troops then returned to Burlington Heights while the Americans retreated all the way to 40 Mile Creek. 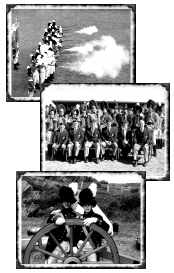 During the summer of 1813 over 100 of the Royal Newfoundland Regiment were assigned as gunners and marines on the British Fleet on Lake Erie. 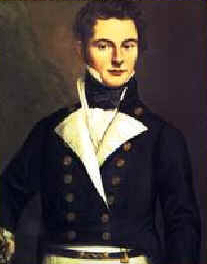 In September 1813 Commodore Barclay led the British Fleet from the Detroit River to Put-In-Bay. He had with him six ships and 407 officers and men. The American Fleet commanded by Captain Oliver Perry, totaled nine ships with 532 officers and men including a number of Kentucky sharpshooters. On the morning of 10 September both fleets opened fire just off West Sister Island in Put-In-Bay. The battle of Lake Erie lasted about three hours. Although the British pressed the attack they lost the Battle of Lake Erie to a superior American naval force. The battle itself was a complete disaster for the British. It was the first time in history that an entire British fleet was defeated and completely captured by an enemy. Barclay was badly wounded and lost full movement in his one remaining arm. At his inevitable court martial, Barclay was absolved of all blame for the Lake Erie defeat. He had to wait another ten years however, to be promoted to the rank of full navy captain. Fourteen members of the Royal Newfoundland Regiment including Lieut Garden were killed and their remains committed to Lake Erie. Another twenty five were wounded and were held as prisoners of war and forced to march through Ohio to Frankfurt, Kentucky where they spent the remainder of the war under appalling conditions. The loss of the British Naval Fleet on Lake Eire exposed the entire British Army to attack. General Proctor, the British Commander, decided to burn Fort Detroit and to retreat to the Canadian side despite the protests of Tecumseh and the Indian allies. A week later the British burned and departed Fort Amherstburg ahead of the advancing Americans. At Moraviantown on the Thames River the Americans caught up with the retreating British. 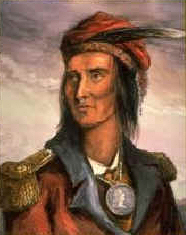 The Shawnee Chief, Tecumseh was killed as the Indians provided the British time to reach Burlington Heights. Proctor’s force, which included elements of the Royal Newfoundland Regiment had been driven from the entire Detroit Frontier and had only a tenuous hold on the Niagara frontier. The year 1813 ended with an American Force defeated at Chrysler’s Farm. The Americans had assembled an invading force of some 8000 troops under General James Wilkinson intent on striking at Montreal and then Quebec. The Royal Newfoundland Regiment manned the gun boats which were sent out from Kingston charged with following the American advance down the St. Lawrence River. The British caught up with the American rearguard at Chrysler’s Farm. The gunboats blasted the American position sending them into confusion. The loss of his rearguard forced General Wilkinson to postpone his assault on Montreal and return to the American side of the border. Two officers of the Royal Newfoundland Regiment who commanded gunboats, Lt Andrew Bulger and Captain John Hierlihy gained citations for their heroics in this engagement. In May 1814 two companies of the Royal Newfoundland Regiment were sent to Fort Mackinac to repel an expected American assault. 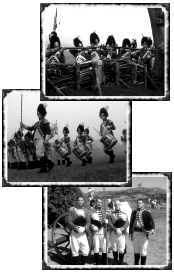 The Regiment helped stop the advance forcing the Americans to give up the plan. Two American ships, the Tigress and the Scorpion were left to harass the British position. A handpicked raiding party which included Lt Andrew Bulger and other members of the Royal Newfoundland Regiment was sent out with the intent of capturing both vessels. They rowed downstream and under of cover of darkness were able to board and overcome the surprised defenders. The Scorpion was taken the next night under a similar plan and both vessels were returned to Mackinac as prizes of war. Lt Bulger and fifty other Newfoundlander were next sent to organize Fort McKay situated at the junction of the Wisconsin and Mississippi Rivers. From Fort McKay the recently promoted Captain Bulger planned to harass American forces in the Mississippi Valley. This plan was disrupted by news that the Treaty of Ghent had been signed on Christmas Eve in 1814 effectively ending the war. 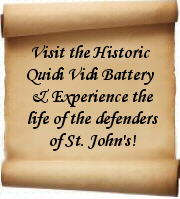 The remnants of the Royal Newfoundland Regiment were sent to their homes in St.John’s and given garrison duties. 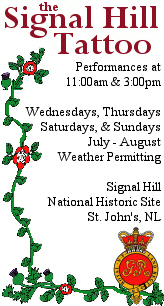 In 1816, the Royal Newfoundland Regiment was disbanded under British orders concerning the reduction of Fencible Regiments.